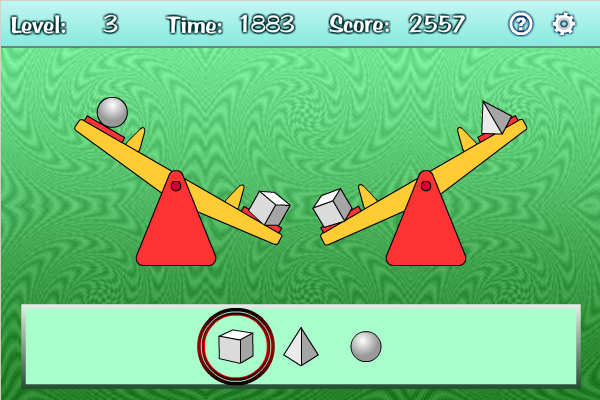 In this game there are some seesaws and some objects place on the seesaws. When two objects are placed on the two sides of a seesaw, you can tell which one is heavier by the direction of inclination of the seesaws. There will be more than one seesaws so you need to make multiple comparisons in order to find out the heaviest item. There are a total of 20 levels. Match colorful flowers to remove them and free space for new ones. To remove flowers from the grass, get a group of 3 or more assembled in vertical or horizontal line. You are welcome to the enchanted world of the elves. Solve its mysteries and discover its divine treasure. In search of the elf treasure Elythril you must pass through 15 elfin lands. Choose whatever you like: Hard or Easy game. Mac version. Hangman for mobile (touch) is a classic word guessing game. The mobile phone thinks of a word and you need to guess it by suggesting letters. The word to guess is represented by a row of dashes, giving the number of letters.